Deano Jones has many skills and he shows us in his book Rise of the Cafe Racer. Not only is it a great story with beautiful images, and a rock soundtrack to listen to as you read, it is a work of Art. It’s the first book of it’s kind anywhere and truly creates a vivid experience that brings this unpredictable vampire story to life. 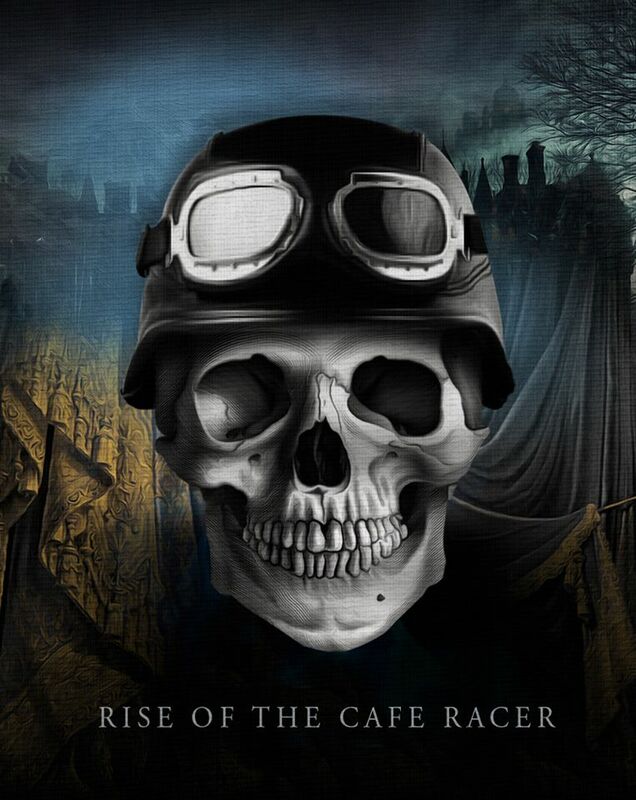 A post-apocalyptic vampire story, Rise of the Cafe Racer is a superbly written and carefully thought out book featuring multidimensional characters with a theme of living in the moment. 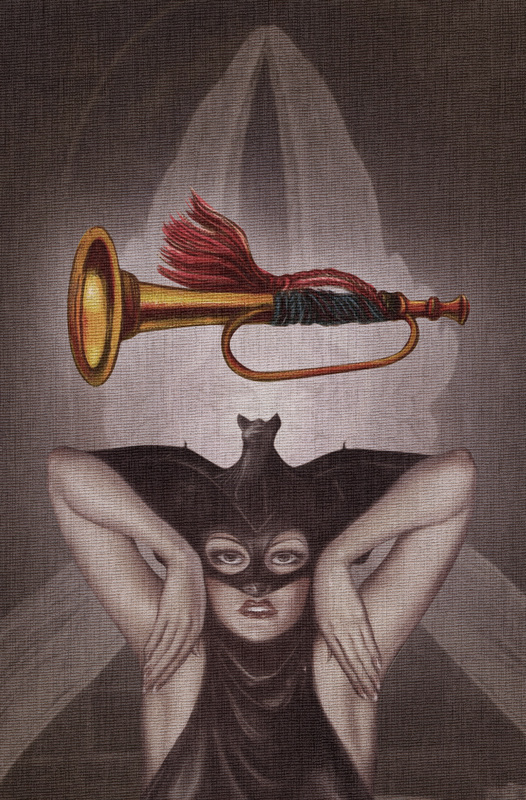 The reader is immediately engaged into the lives of the vamps in “The Realm” and the action continues with the author’s subtle sense of humor detected throughout the story line. In addition to a fantastic story, there are hundreds of detailed illustrations which correspond to the story. The attention to detail describing the Realm and its history is like nothing we have ever seen before and the development of the characters and relationships involved is where Deano’s talents shine. The book also contains an equally amazing rock soundtrack which was written and sung by Deano Jones. Truly the first of its kind. Deano Jones is now doing speaking engagements organized by the Austin Library geared toward younger readers to help encourage them to write their own stories. Deano believes that the young can accomplish great things when motivated by example. “After all, I’m no English literature grad and I didn’t even write my first book until I was 40.” says Deano. In our interview, Deano Jones give us a peek into the duels of his fascinating mind at work. Where did the idea that is Rise of the Cafe Racer come from? I was asked to write a rock musical for a local Austin theater. I wanted something kinda like “Cry Baby” meets “Grease’ in the beginning. But quickly incorporated my love of sci-fi Fantasy ala LOTR. I decide last minute to make them Vampires, not because it’s a popular genre now, but more because I wanted the stage production to be dark with Victorian era / Gothic wardrobe set and design. It became so detailed so quickly that I knew I had to write a book instead. 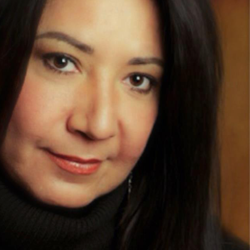 You are multidimensional character yourself, did developing this story come naturally to you? I have been doing a lot of improv comedy and improvised musicals for a few years now and it did just come pretty natural to be jumping in and out of different characters. Did you expect it to be the sensation it became? Not at ALL. I was surprised I even finished it! haha. But I wrote it very much in an improvisational style. “Jump and Justify” is a term we use a lot in improv. I would write these very detailed songs and then force myself to weave them together to make sense. I think it’s why it has started to become popular. It’s not that predictable and it has an entire 12-song soundtrack that’s included with the book. I think that just helped it stand out from the standard novel. So what is next for the Realm Series? I’ve already almost finished the second soundtrack for the second book. I have the entire 2nd & 3rd book outlined, and honestly there’s room for several more. Rise of the Cafe Racer ends with a pretty unexpected ending that allows the story to really expand it’s boundaries, create additional lands and creatures and, for me at least, becomes SO much more complex and epic. I’m really excited to actually begin writing Book Two, it’s going to be monumental in comparison. Mostly though, I’m just so happy that there’s a small, growing number of fans that really love the world I created. As I said, I’m a Lord of the Rings geek and went really crazy with the details of the “Realm” that I created. There’s hand drawn maps of the world, a detailed history of the Realm and even a glossary of indigenous terms for the series. There’s several story arcs and I am so enamored with this story that the real measure of success has been personal. I wrote the story and book and soundtrack that I WANTED TO READ. I’m most proud of that. Finding and becoming social with people who are as interested in the book has been such icing on the cake, because those people ARE ME. I want a world that’s perfectly crafted, with no ridiculously inexplicable events or narrative that just gets dismissed as “vampire” stuff. I tried to make a very believable world. 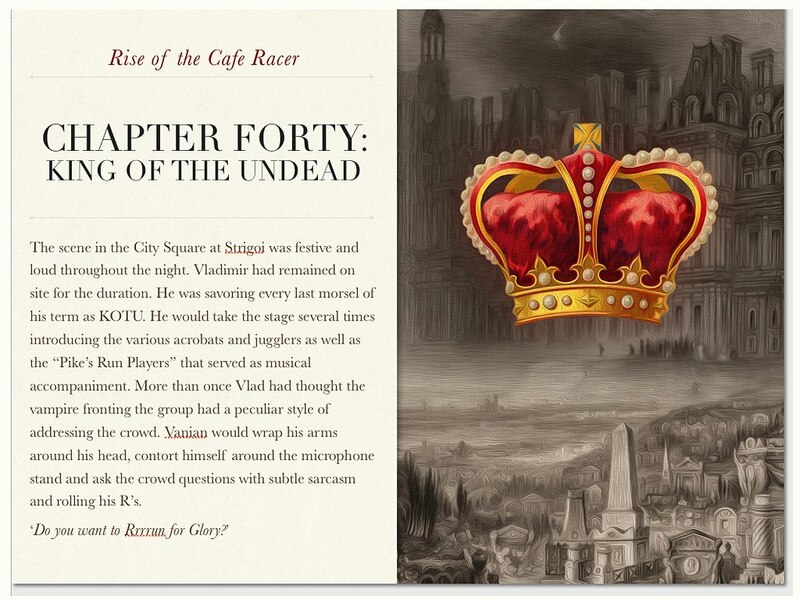 Rise of the Cafe Racer is the first book in The Realm Series that follows the lives of Vampires in a post-Human world. Sonny Legatus doesn’t think there’s anything special about himself. He’s just an ordinary Fledgling-aged Vampire living in the Upperlands of the Realm. Like all Vampires, he has to pick a “Specialty” and work it until his bones collapse. While others are planning for their future, Sonny dreams about living for and savoring “The Moment”. The idea that just one beautiful moment in time could be more powerful than hundreds of years of mediocrity consumes him. And it’s not just him—there’s a growing movement among Fledglings to reject the Rules of the Realm and simply not choose a Specialty. 1089 years after the last Human was hunted into extinction, the Realm of the Vampire looks startlingly similar to the last days of mankind. 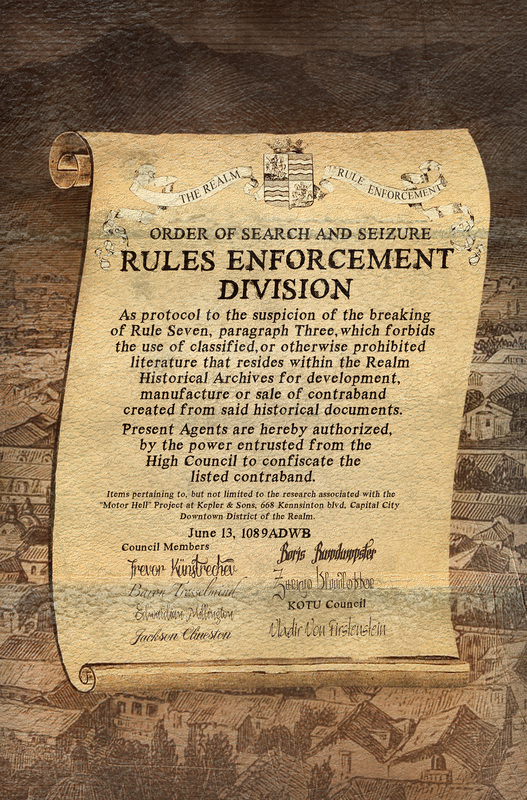 Without human blood to feed on, Vampires have no supernatural powers—just a High Council that dictates their lives. But when the Pike’s Run returns— a motorcycle race that only happens once every 121 years— there’s finally a chance to dream, a chance to live for the moment, and a chance for an ordinary person to become… King of the Undead. 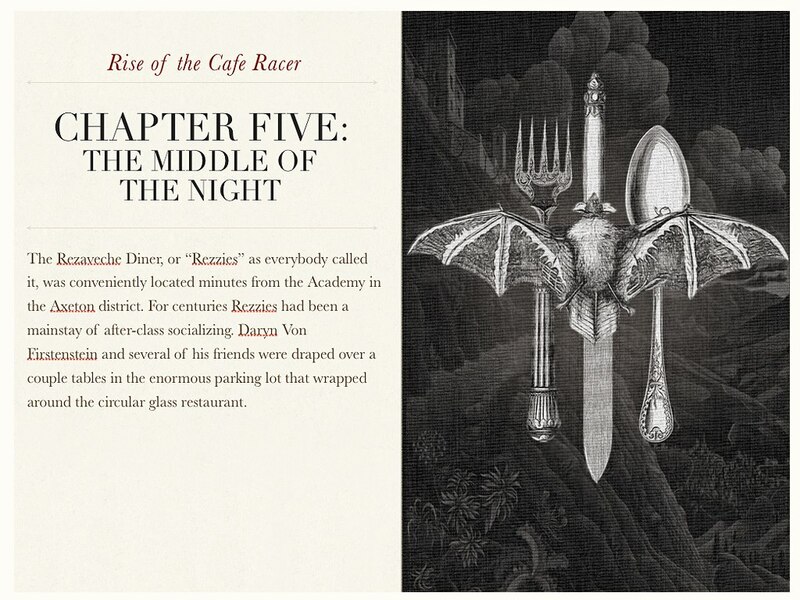 “Rise of the Cafe Racer” is an elaborate tale within the world of the Vampires of the Realm. 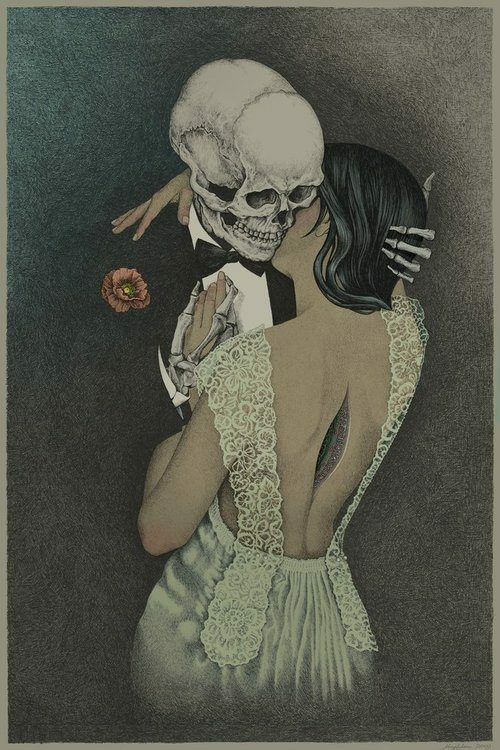 A tale with several perfectly-woven story arcs of passion, corruption, true love and a motorcycle race that determines the King of the Undead. An enhanced iBook, multimedia, vampire novel that has continued to remain in the Top 11 of Apple’s “Hot New Sci-Fi & Fantasy” category on the iBook Store as well as in the “Best Seller” category also on the Apple Store. it’s an experience that will leave the reader with a sense of having visited another world… and hungry for the next books. Deano Jones, first time author, is a musician, graphic designer, improvisor, actor and comedian. Living in New York City during the 90’s Deano fronted the theatrical punk band Clowns for Progress. Since moving to Austin in 2005, Deano has recorded music as a solo artist and is a regular performer in Austin’s thriving improv comedy scene. He runs a graphic design company and has a small army of French and American Bulldogs at his home. Download for Free on iTunes. Available on iPad on Mac.